I call upon Apple to cease its offering of Fox News as a primary news source to users of iOS, let alone one activated by default. So long as it does, then Apple overtly allies itself not just with low-quality and deceitful information, but with the white-supremacist ethno-nationalist agenda that Fox has openly contributed to since the start of the Trump administration. I do not think Apple wishes to harm America in this way, and I ask that it stop. This screenshot from my own iPhone shows the “Browse” panel of Apple’s News app, scrolled down just a bit. You can see that Fox News, signifying itself with an enormous fluttering American flag, appears as a top-level source for content. I discovered this screen only a few days ago, weary with the gut-pulses of disgust I’d feel every time a Fox-branded headline bobbed among the various others on my phone’s dashboard. They were invariably trivial “weird news” stories, attacks on more objective news media, or obsequious praise for Trump and his gang, chafingly mixed in among other sources’ more substantial headlines. I’d never actually configured the News app, you see; Apple had apparently marked Fox News as a default, common-denominator content source for lazy customers like me who couldn’t be bothered to tune the app’s output to my own tastes. But, on an annoyance-fueled whim earlier this week, I plunged in. After a few minutes’ exploration, including the discovery of the screen pictured here, I can report that the app no longer pollutes my phone with Fox’s cynical distractions. For me, however, this became one of those situations where tucking an unpleasantness out of sight did not at all put it out of mind. As recently as two years ago, I think that I would have let the issue go at this point. For decades I’ve felt content to simply disregard Fox News, the way I might a supermarket tabloid: tasteless, perhaps, but doing me no harm so long as I ignore it. Forced to consider it anew through the action of fiddling with preference-screens on my phone, I realize that I don’t feel this way any more. Need I go into detail about the ways that the powerful Fox News of today operates to actively dismantle American democracy, and support long-term harms to human civilization in exchange for sustaining the plutocrats whose support they enjoy? In just the last week alone, Fox dismissed Hispanic Americans as crypto-foreigners. Days later, it backed the president — erasing its own earlier on-air reporting — the moment he denied universally corroborated reports that he had tried to fire Robert Mueller last summer. These are just two close-to-hand examples of Fox’s red-meat racism and boosterism, keeping it in the good graces of the worst parts of the American executive office, who in turn keep listening as it directly advises them every morning. All this on the surface! Fox News is a state-allied white nationalist propaganda network, assisting the most selfishly short-sighted factions of American power-holders by sowing confusion and chaos in a bid to strengthen their grip. Only the tri-colored veil of noisy jingoism above Fox’s logo on that screenshot separates its overt agenda from those of fellow-traveler news organizations like Russia Today, 4chan, or the Daily Stormer. I don’t expect that Apple’s News app will ever offer the top headlines from any of those websites. Why, then, does it continue to offer them from Fox News? I request no censorship here; I’d never suggest that Apple stop the users of its operating systems from reading any news they choose via the open web. Let people continue to visit any site they’d like with Safari and such. But Apple, the company that unilaterally changed an emoji from a deadly handgun to a plastic squirt-gun, has a chance to make another small, positive step in the direction of social responsibility. Apple can rob the Fox News tumor of the rich attention-source provided by the News app’s default settings. 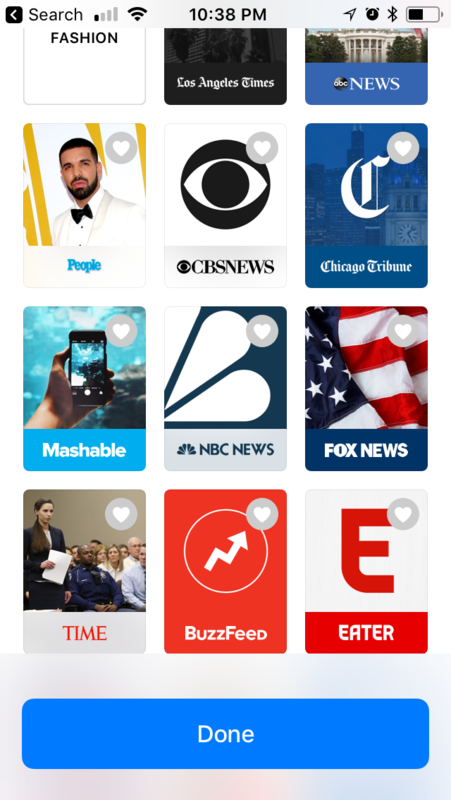 The company could instead direct its customers to healthier sources of news — which I dare say, comprises literally everything else currently offered by the News app. That makes the solution rather obvious to me.